WHAT IS THE TRUTH BEHIND THESE GHOSTLY APPARITIONS? Interlocutor... Moving on to the first question that I have scheduled. Can the spirits of error project holographic images? The question is related to several images that throughout history have appeared in the skies. Ruanel: Most of those images were not projected by extraterrestrials but by spirits of error, their purpose is mainly to subject people by means of fear. But there are also cases where extraterrestrials have made the same effect and they didn’t know anything about the spirits of error. Interlocutor: Is their final purpose always to subject people? Ruanel: Correct, but with regard to aliens it is necessary to highlight that only perverse aliens do that. Interlocutor: Obviously extraterrestrials produce those images using machines, but the question is: How the spirits of Error can project those holographic images? Ruanel: Making focus. In the same way when they move objects in the physical plane by making focus, they can also project similar images to holographic projections. Their purpose is to sow panic on incarnated beings, to confuse them, to provoke fear, to plunge them into ignorance... don’t forget that when people are more ignorant they can be manipulated easily. Ruanel: The images are external and the proof is that in the mystic meetings all the people see the same thing. In fact, the images are mass projected but in spite of that, the perception is also individual, in the causal body or body of ideas of everyone. They are like filaments that go to each brain. Interlocutor: But the projection is only one? Ruanel: Yes, it’s only one projection directed to thousands of minds. Interlocutor: What about these solar phenomena that generally accompany to these alleged Marian apparitions? Ruanel: They are individual mental phenomena that is to say, projections made by aliens or spirits of error so that each person sees the sun rotating, changing color, moving, falling, etc. It’s absurd to think that a star of such magnitude as the sun could perform such movements. Interlocutor: Whenever we speak of aliens, we are speaking of the use of machines? Ruanel: All the phenomena of the physical plane are made with machines. 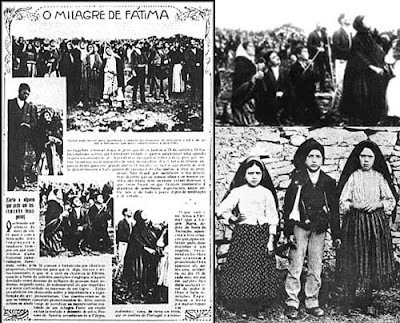 Interlocutor: Summarizing the matter of the alleged apparition of the Virgin at Fatima. Who projected that images, Extraterrestrials or spirits of error? Ruanel: It was a mixture of both. The extraterrestrial started the phenomenon and the spirits of the error went, as you say commonly, "like flies to the candy." Interlocutor: With regard to the aliens Didn’t they do it so that we promote ideas of religiosity and in this way at least we won’t kill each other? Ruanel: No, not at all. The extraterrestrials that projected the images were of the worst kind... you speak of religiosity, but Don't you know that there is nothing worse than religiosity? The more they worship the more underdeveloped they are. Interlocutor: Master, I have a clear picture of what the purposes of the spirits of error are, but I don't have a clear idea of the purpose of the aliens who projected those images. Ruanel: The purpose of the aliens is dominance. Ask yourself about the reasons that terrestrial leaders have to conquer other defenseless countries and you will have the answer. Ego is always in the middle. When there is Ego there is prominence. And when there is prominence, one doesn’t serve but rather one wants to be served. This entry was posted at Sunday, August 02, 2009 and is filed under Mysteries and Enigmas . You can follow any responses to this entry through the .